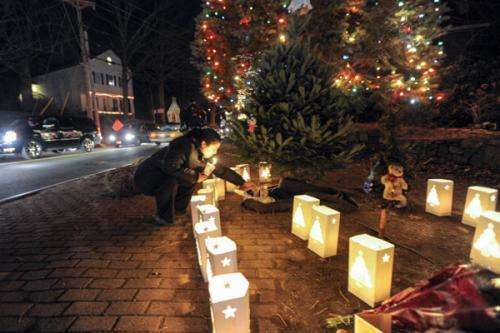 3Qs: After tragedy in Newtown, what's next? The grieving com­mu­nity of New­town, Conn., is taking its first steps toward recovery fol­lowing a deadly shooting ram­page at Sandy Hook Ele­men­tary School last Friday. In a speech Sunday evening, Pres­i­dent Obama con­soled the fam­i­lies of New­town and promised to use the powers of his office to take action, saying, "These tragedies must end." We asked North­eastern fac­ulty mem­bers from three dif­ferent dis­ci­plines to explain what could follow this hard-​​to-​​process event. How should parents and teachers talk about the events in Newtown, Conn., with young children? What particulars must they take into account? Louis Kruger, an asso­ciate pro­fessor of coun­seling and applied edu­ca­tional psy­chology in the Bouvé Col­lege of Health Sci­ences: Adults should remain calm about the sit­u­a­tion because many times chil­dren will get anx­ious when they're seeing that impor­tant adults in their lives are anx­ious. There are few things more impor­tant in a sit­u­a­tion like this than being a good lis­tener and ensuring chil­dren feel com­fort­able to express their feel­ings. Adults need to stick to the facts and not embellish them or rumi­nate on what they mean. Expla­na­tions have to be devel­op­men­tally appro­priate. For early ele­men­tary school chil­dren, par­ents and teachers need brief, simple expla­na­tions with reas­sur­ances that they will be safe. Older chil­dren may be able to ver­balize impor­tant ques­tions and have an impor­tant dia­logue about what they think. There's nothing wrong with par­ents com­mu­ni­cating that this was a ter­rible event, but they also have to com­mu­ni­cate that school is a very safe place. Chil­dren shouldn't be watching news cov­erage on TV or get­ting news cov­erage else­where, from sources such as the radio or online. Instead, par­ents and teachers should be the pri­mary source of infor­ma­tion so they can observe their behavior and assure them that they will be safe. In the aftermath of the Newtown shootings, what legal issues do you expect to come to the forefront of the national discussion? Daniel Medwed, a pro­fessor in the School of Law: I expect the pri­mary response to this shooting to come from leg­is­la­tures at the fed­eral and state level. In law, there's the idea of "insti­tu­tional com­pe­tence," which asks what agency is best suited to take action. And in this case, var­ious enti­ties like the courts may try to take action, but I think leg­is­la­tion will be the biggest venue for debate and where we are most likely to see a response. One likely con­se­quence is a rein­vig­o­rated debate about the legality of assault weapons, which has faced scrutiny from the NRA and gun enthu­si­asts who have advanced the idea that such pro­hi­bi­tions are the start of a slip­pery slope: If you start ban­ning assault weapons, where do you draw the line? But I sus­pect this tragedy will suc­cess­fully renew the debate sur­rounding assault weapons in par­tic­ular and, I hope, will result in fed­eral leg­is­la­tion ban­ning assault weapons and semi­au­to­matic weapons, nei­ther of which have real use in hunting or self-​​defense. I think this shooting also raises new legal ques­tions, such as whether a law could take into account who else at a gun owner's home could have access to the weapons. The guns used in the shooting didn't belong to Adam Lanza; they belonged to his mother, who acquired them legally. He didn't own the guns but had access to them—this could lead to new rules, pos­sibly at the state level, about home safety and how to ensure that only a reg­is­tered user has access to a firearm. Could a legislative response adequately address the problem of gun violence in the U.S.? Jack Levin, the Irving and Betty Brud­nick Pro­fessor of Soci­ology and Crim­i­nology and one of the nation's leading experts on mass murder: The problem is that we're so caught up with this case that we have tunnel vision and may not do any­thing that is effec­tive. This is a very rare kind of case—the last time that an ele­men­tary school was tar­geted was in 1989—and since then the cases of school shoot­ings haven't looked very much like the one in New­town. Typ­i­cally the killer is a stu­dent in middle or high school who wants revenge against his class­mates after being bul­lied, harassed, humil­i­ated, and ignored for many years. If we really want to address the gun con­trol issue, what we should do to pre­vent the mur­ders of chil­dren is get hand­guns out of the hands of underage teenagers. We have about 12,000 single-​​victim mur­ders every year in this country, most of which are per­pe­trated with hand­guns, not semi­au­to­matic weapons, and many of which target chil­dren. That's com­pared to the about 100 vic­tims of semi­au­to­matic guns in this country on a yearly basis. There was a fed­eral assault-​​weapons ban in this country from 1994 to 2004 and it was during this period that we had a string of school massacres—including Columbine—committed with semi­au­to­matic guns. It may be too late to address this issue. But we can still find ways to deal with this: We can break the cul­ture of silence where people hear of threats and do nothing about it. We have already made inroads in that here in Mass­a­chu­setts: We have seen plans for school shoot­ings in places like Marsh­field and New Bed­ford that were thwarted because stu­dents told an adult and author­i­ties were able to inter­vene before it was too late. 3Qs: Energy drinks: What's in your can?